Whether taking an evening stroll or driving through the community, rear load garages help to create a pleasing streetscape for passersby. When visiting suburban communities which were built in the last 20 years, you are likely to notice an endless line of prominent garage doors. This can be especially true in active adult communities where small homes often appear to be dwarfed by their two-car garages. Some builders have found a way to increase curb appeal by designing homes with hidden, rear load garages. Look back a generation and you will see that a typical home was designed with an inviting front porch surrounded by lush landscaping. If the home had a garage at all, it was often detached and set far back from the street. This let the house sit in prime view of passersby, but wasn’t always practical for homeowners. Newer homes became more accessible as attached garages let car-loving homeowners pass easily into the house during any kind of weather. However, the practicality of an attached garage can detract from the home’s general curb appeal. Enter the rear load garage. With an eye to an enhanced curb appeal, some builders have begun to design homes with rear load garages. By moving the garage to the back of the home, builders keep the practical aspects of an attached garage while improving the overall look for neighbors and those who drive through the community. Several active adult communities have embraced home designs with rear load garages. 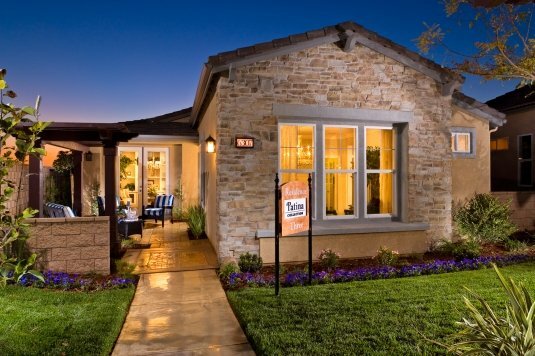 In California, K. Hovnanian has three relatively new developments which each offer a collection of homes with rear load two-car garages. These include the Monarch Collection at Four Seasons at Beaumont, the Patina Series at Four Seasons at Bakersfield, and the Legends Collection at Four Seasons at Hemet. Other communities throughout the country also feature some homes with rear load garages. Single-family homes with front porches and rear load garages can be found within Del Webb at Rancho Del Lago in Vail, Arizona, The Cottages at The Village of Carolina Place in Pineville, North Carolina, and Parkview Villas in Golden, Colorado. Single-family homes are not the only option in active adult communities and some attached homes are also available with rear load garages. Carillon Club in Naperville, Illinois, offers Holiday Series Townhomes with four different floor plans, each featuring rear load garages. In Bristow, Virginia, Dunbarton has duplex homes with attached rear load one-car garages. Active adult communities which feature inviting front porches, rear load garages and ample sidewalks, embrace the atmosphere of small town America. Whether taking an evening stroll or driving through the community, rear load garages help to create a pleasing streetscape for passersby.